Obert Chinhamo is one of the founders of the Anti-Corruption Trust of Southern Africa, which is one of the leading campaigners against corruption and bad governance. Other notable personalities driving the organization, include Arnold Tsunga, Alouis Munyaradzi Chaumba, and Norman Tjombe to name but a few. Before assuming a full-time position in the anti-corruption watch-dog, Obert was in the United Nations, which he joined after having been employed by Amnesty International- Zimbabwe. 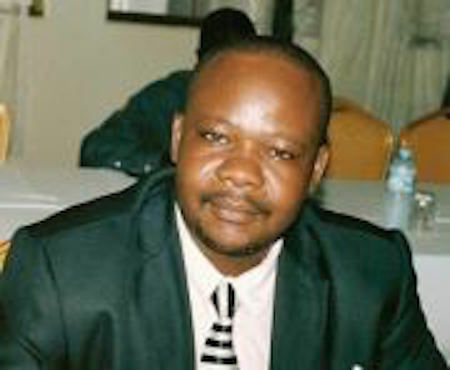 In the Amnesty International, he has been a human rights defender, which earned him persecution by the government of Zimbabwe and hence being forced into exile, which explains why he is one of the few Zimbabweans who took the government to the African Commission on human and Peoples’ Rights. More information is available at www.achpr.org/communications/decision/307.05/, though he felt let down since during the time, he could not exhaust local remedies in Zimbabwe since they were not only unavailable but were not effective. Since July 2014, Mr. Chinhamo committed himself to serve in the Anti-Corruption Trust of Southern Africa in a voluntary capacity, without any form of remuneration. Furthermore, he committed himself to paying for office space and started implementing a community based anti-corruption project titled ‘Community Action against Corruption and Poor Service Delivery’, through which Community-based Anti-Corruption Monitoring Voluntary Action Groups were set up in Kwekwe, Gokwe North, Gokwe South, Masvingo, Zvishavane, Chimanimani, and Chachacha. The members of these groups monitor, report and take action against corruption through Mr. Chinhamo’s leadership. It is this project and its impact that made Mr. Chinhamo a perceived enemy of some agents who felt that they were being threatened by the arrests that the police were making. The project has so far resulted in the arrest and imprisonment of many people who include prosecutors, prison officials, and members of the public to name but a few. There are many corruption cases implicating senior government officials that were forwarded to relevant authorities for investigations. As a result to his work, Mr. Chinhamo has been under surveillance from unknown people believed to be security agents and other individuals who feel threatened by his work. These unscrupulous elements have been visiting Mr. Chinhamo at home and at work. In 2014, law enforcement agents have been visiting and threatening to close the office of the Anti-Corruption Trust of Southern Africa since some of the individuals being investigated were the law enforcement agents themselves and politicians. However, in 2015, the situation worsened. On the 24th day of July 2015, Mr. Chinhamo was visited at his house by unknown men threatening to kill or cause his disappearance for his anti-corruption work in the country. Furthermore, on the 13th of August 2015, he was again visited by unknown men. The major cause of concern is that he is being visited at home, which worries everyone since his family could also be in danger. The matter was reported to Redcliff Police Station. Regardless of the threats and visits by unknown men, Mr. Chinhamo made it clear that he will not retreat but will continue fighting corruption considering its deleterious effects to national development. Giraffe Heroes Zimbabwe honors Mr. Chinhamo for his outstanding work in exposing corruption at a great risk to himself, team and his family.